Hello everyone!! Today is 1/11/11 (so cool!!) and I get to share a project with you on the ScrapbookPal blog. I made this card with the Rock Princess Cricut cartridge that ScrapbookPal sent me to work with this month. Cut the princess on page 37 of the handbook at 3 inches. Cut the layers in the colors shown above and assemble the image. I used my Cuttlebug and the Swiss Dots embossing folder on her skirt before I assembled it. Add some pink Stickles to the crown and allow it to dry. Cut the Diva phrase on page 69 of the handbook at 1 3/4 inches from chipboard (I suggest the deep cut blade and housing with multi cut on to cut the chipboard). Use some good adhesive and adhere silver glitter to the chipboard phrase. 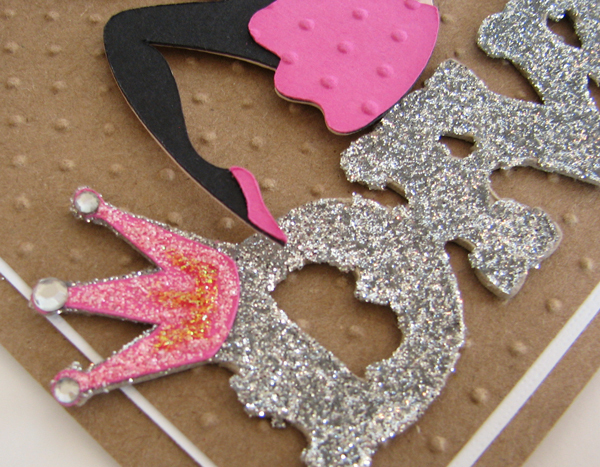 Cut out the crown layer in pink and adhere over the crown on the "D". Use some pink Stickles to add sparkle to the crown. Apply rhinestones to the top of the crown when the Stickles is dry. Use the Cuttlebug and the Swiss Dots embossing folder to add texture to a 5 1/8 x 3 7/8 inch piece of kraft cardstock. Adhere this piece to a 5 1/4 x 4 inch piece of white cardstock. Add these background layers to a kraft colored A2 card base (4 1/4 x 11 inches folded in half to make a 4 1/4 x 5 1/2 inch card with the fold at the top). Assemble the card as shown in the picture above (I used some dimensional adhesive under the princess image to help her look like she is sitting on top of the Diva phrase). Attach some matching pink ribbon to the top of the card and tie it off in a bow. Attach a rhinestone to the middle of the bow. I added some fruit punch Stickles when I meant to grab the pink to fill in a spot that I accidentally touched before it had dried. When I noticed my mistake, rather than wipe it off or try to correct it, I added some more of the wrong color to help add some dimension. I hope that I have inspired you to pull out that Rock Princess cartridge and give it a try. So cute! I really need to check out that cartridge!Thanks for the inspiration! Love it Amy! Great job! This is really a very cool card you have here. The whole idea is so creatively done.